With so many versions of the gospel being marketed to the public, which message is correct? Why do so many professing Christians not know the essential elements of the message that Paul deemed to be the very “power of God for salvation” (Romans 1:16)? The Gospel of Our Grandfathers offers a theologically deep yet understandable overview of the glorious gospel that was “once for all delivered to the saints” (Jude 3). The Gospel of Our Grandfathers is a simple work that seeks to bring you face-to-face with the attributes of God, the plight of man, the excellence and sufficiency of Christ, the application of redemption, and the assurance of salvation. Whether you are a seasoned follower of Christ, a new Christian, or a curious skeptic, you will find in this account a clear, biblically saturated presentation of the message that men of old have proclaimed and men of valor are called to proclaim still. An engaging overview of the Bible's story of redeeming grace, a grace that finds its ultimate expression in the Person and work of Jesus Christ. In twelve engaging chapters, the reader is taken on a journey through the Old and New Testaments and pointed incessantly to Jesus Christ, the One who both satisfies God's wrath against sin and expresses God's love, mercy, and forgiveness to the undeserving. Biblically grounded, God-exalting, and accessible to a wide range of readers, "Scandalous" is a unique, convicting, and encouraging read. Each chapter conclude with discussion questions that can be used individually or as a group study. What is the heart of the Christmas season? Amid the lights, gifts, food, and frenzy of the holidays, many of us long to be reoriented to what matters most. In short, we need to see and be enthralled with the Person and work of Jesus Christ. This Advent season, pastor and author J. A. White invites you to embark on a twenty-five day journey of growing in your affection for the King of kings. From December 1st to Christmas day, "The King's Mission" offers short daily devotionals that will highlight the life, death, resurrection, and ascension of Jesus Christ. With a balance of gravity and levity, White aims to exalt the Lord Jesus Christ and his work of redemption. Whether reading on your own or with your family, "The King's Mission" will keep Christ and his glory at the heart of your Christmas. Many theologians lovingly refer to the eighth chapter of the Book of Romans as The Great Eight. In its thirty-nine verses, this great chapter is a repository of blood-bought promises that come to the Christian by the nail-pierced hands of the Savior, Jesus Christ. In times of suffering and loss, this great chapter has proven to be a refuge for the weary saint. 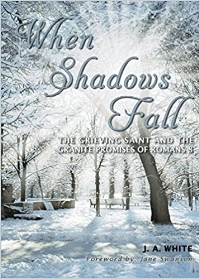 To this end, When Shadows Fall seeks to unpack these precious promises for the joy and endurance of the grieving believer. In twelve accessible chapters, pastor and author J. A. White takes his readers through the entirety of Romans chapter eight, explaining and applying each portion of Scripture with pastoral sensitivity and biblical accuracy. Paul's Big Letter is kid-friendly study of the Book of Romans, the apostle Paul's biggest and grandest letter. Designed for ages 8-12, this study presents the truths of Romans in understandable and engaging language. A great tool for families and church leaders alike, Paul's Big Letter will help your little learners see and savor the glory of the gospel!